After witnessing a week of high-intensity badminton at the 2017 BCA Indonesia Superseries Premier, another Badminton World Federation (BWF) tournament takes us to Sydney as the city hosts the Crown Group Australian Superseries. The Australian Open is one of the most prestigious events on the circuit and it had its first edition in 1975. The tournament is the last major competition before the World Championships in Glasgow, which is slated to take place from 21-27 August. A total of 19 Indian shuttlers – three in women's singles, six in men's singles, three men's doubles pairs and one duo each from women's doubles and mixed doubles – will participate in the main event starting from Wednesday. All eyes will be on defending champion Saina Nehwal and the unseeded shuttler begins her title defence against Indonesia Open runner-up Sung Ji Hyun. Though Saina enjoys a 6-2 lead in the head-to-head meetings, facing fourth seed Sung Ji will be a tough test given the South Korean's exceptional form in Superseries tournaments. Saina was shown the door in her previous meeting with Sung Ji Hyun at the All England Championships earlier in the year. Elsewhere, fifth seed PV Sindhu, who was knocked out quite early in Jakarta, squares off against Indonesia Open winner Sayaka Sato. The Japanese shuttler got the better of Sindhu at the 2016 Denmark Open. However, Sato's fitness is a big question mark as she might need more rest before stepping out on the court again. As for Sindhu, she needs to kill the game early on to avoid pressure in the latter stages of the match. Ruthvika Shivani Gadde will face Chen Xiaoxin of China in the first round after winning her qualifier on Tuesday. It looks like a cakewalk for World No 1 Tai Tzu Ying, who will be up against the unseeded Kristy Gilmour in her first round, while Carolina Marin crosses swords with Japanese Nozomi Okuhara after a disappointing first round exit in Jakarta. Fresh from a resounding win at the Indonesia Open, Kidambi Srikanth is lined up to face Chinese Taipei's unseeded Kan Chao Yu. 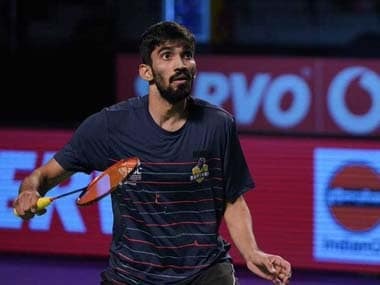 Both shuttlers will face each other for the first time on Wednesday but Srikanth must not get carried away after his win and continue to play with the same focus. "The Australian Open is the last tournament before the World Championship and I am looking forward to it. Indonesia Open is a big confidence-booster for me ahead and I would give my 100 percent here. I hope there is a lot more to come," Srikanth said. India's highest-ranked male shuttler, Ajay Jayaram, who missed out on the Jakarta event due to fitness concerns will be eager to shrug off his inconsistency against Hong Kong's NG Ka Long Angus in the first round. Jayaram is yet to open his account against Long, losing all their previous three matches. Meanwhile, high-flying HS Prannoy will take on England's No 1 Rajiv Ouseph in the first round. Prannoy must put on a series of dominating performances, like he did in Indonesia, as he is slated to face tough opponents on his potential path to the final. Fit-again Parupalli Kashyap locks horns with World No 1 Son Wan Ho, who has beaten the 2014 Commonwealth Games winner on five occasions. Kashyap defeated Zhao Junpeng and Indonesia Open runner-up Kazumasa Sakai in a space of two hours in the qualifiers and the 30-year-old was unhappy with BWF's scheduling yet again. B Sai Praneeth faces Indonesia's Tommy Sugiarto, while Siril Verma takes on defending champion Hans-Kristian Solberg Vittinghus of Denmark in the first round. World No 2 Viktor Axelsen and World No 3 Lee Chong Wei withdrew from the Australian event on Monday. Their reasons are yet to be known but this gives a chance to the Indian men's singles shuttlers to do well in their absence. In doubles, Manu Attri will be back in action after recovering from a lengthy injury. Attri and Sumeeth Reddy will have their task cut out against third seeds Takeshi Kamura and Keigo Sonoda, Francis Alwin and Tarun Kona will take on Hendra Setiawan and Boon Heong Tan, while young duo of Satwiksairaj Rankireddy and Chirag Shetty face Law Cheuk Him and Lee Chun Hei of Hong Kong. In-form Satwik will also contest in mixed doubles alongside new partner Ashwini Ponnappa. They also played together at the Sudirman Cup in Australia this year. Lee Chung Hei and Chau Hoi Wah are slated to play the newly-formed Indian duo in the opening round. Ashwini will also play women's doubles along with Sikki Reddy, and they will begin their campaign against Hsuan Wendy Chen and Jennifer Tam.